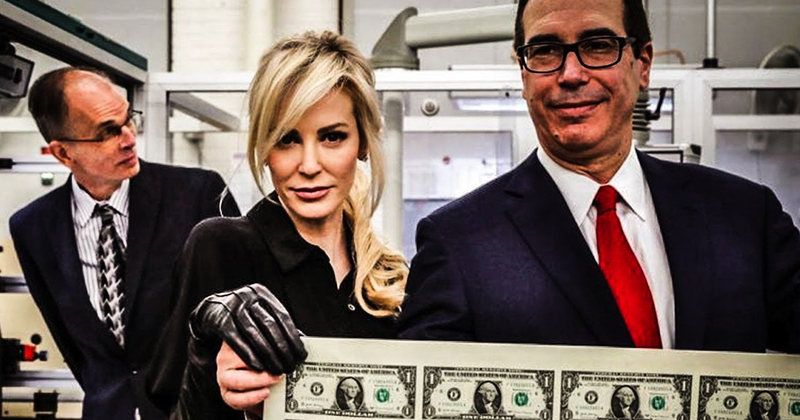 Steve Mnuchin, the Secretary of the Treasury, decided that it would be a good idea for him and his wife to pose with giant sheets of money. This is the same guy that once locked a woman out of her home over a 27-cent debt and he somehow thought it would make for good optics to pose with giant sheets of freshly printed money while his wife stood by his side looking like a movie villain. Ring of Fire’s Farron Cousins discusses this. Treasury Secretary, Steve Mnuchin, is quite possibly at this point, at least this week, the dumbest person within the entire Trump administration. Now, before we get into what Mnuchin did this week, let’s go ahead and take a look back at his history. He is the guy who, as you remember, took his wife on a government-funded private jet to go watch the eclipse from the top of Fort Knox. Taxpayers paid for that trip and he got in a lot of hot water about it. This week, knowing that he has a history of kind of screwing over US taxpayers and US consumers, he decided it would be a great idea, it would be great optics for he and his wife to take a visit to the US Treasury, where they took a picture of themselves, several pictures actually, holding up giant sheets of $1 bills that now bear Steve Mnuchin’s signature because he is the Secretary of the Treasury. As you look at those pictures, it’s not just Mnuchin’s goofy little face that stands out here, and we’ll get more into Mnuchin’s past in just a moment, but his wife. Look at the expression on this woman’s face first when she sees the money and then when she’s holding it up. I mean, for the love of God, this woman looks exactly like a Bond villain. I am sorry, I mean no disrespect, but Mnuchin, you’ve got to look at these pictures and understand that this is a woman who does not care about you in the least. Now, to quote Kanye, “I ain’t saying she’s a gold digger, but … ” You know the rest. Anyway, back to Mnuchin, this guy posing with the money that now bears his signature. In case you aren’t familiar with his history beyond the little Fort Knox eclipse fiasco, he at one point was with Goldman Sachs. As Senator Elizabeth Warren described him, he was the Forrest Gump of the economic collapse in the United States because he always seemed to stumble into these situations, make a hell of a lot of money for himself, and screw things up for everybody else. In between Goldman Sachs stints, he was the CEO of a bank called OneWest Bank, where an investigation detailed his involvement, or his bank’s involvement which he was running, in over 1,000 illegal activities during Mnuchin’s tenure at that bank. 1,000. He’s also the guy who many people remember locked a woman out of her home and were about to foreclose on it over 27 cents. The woman owed 27 cents and Mnuchin, this heartless piece of crap, decided to lock her out of her home. They were going to take it if she didn’t pay 27 cents. Here he is with his super villain wife, posing with sheets of dollar bills, when, in fact, this man should be in prison. Unfortunately, we have Kamala Harris in part to thank for that, who did not prosecute Steve Mnuchin. It wouldn’t even take a genius prosecutor at this point. An investigation found that his company, while he was running it, engaged in more than 1,000 illegal activities. 1,000 individual instances of law breaking while Steve Mnuchin was the CEO of OneWest Bank. Instead of being in prison, he’s allowed to be not only Treasury Secretary, but to walk around freely with his wife and take pictures of his stupid, disgusting, little face holding up pallets of $1 bills, never forgetting the fact that he once foreclosed on not just one person, but many people for owing him less than the total dollar amount of that sheet that he is holding up.